Put simply, paint correction is the removal, not masking or filling, of swirl marks, marring, holograms, and other defects from the surface of your paint through machine polishing and the careful and meticulous use of abrasive compounds and polishes. Of course, when talking about paint defects, no two cars are ever identical, so the paint correction process is very much bespoke in nature. At Driven Colour, we do not perfom a "Cut 'n' Polish". Terms like this are bandied about far too frequently and, sadly, often relate to average results at best. Responsible paint correction is very much about taking a careful and considered approach to the job, rather than merely throwing a polisher around. Before any correction work is undertaken, numerous paint depth readings will be taken to establish whether the paint is safe to be corrected and, if so, the paint surface will be carefully analysed to determine the nature and severity of the imperfections. 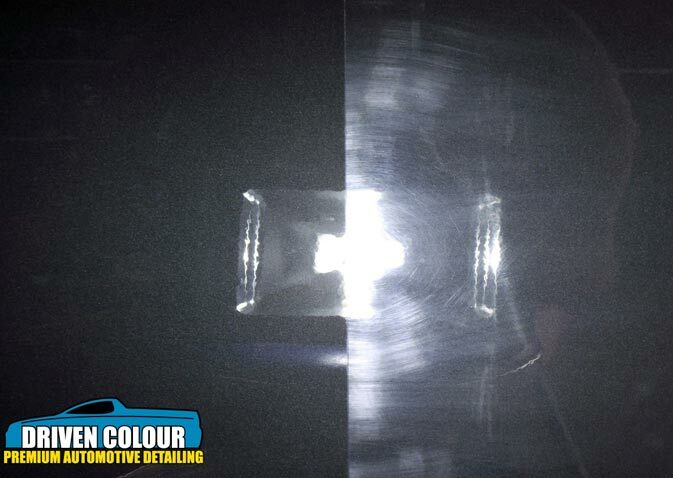 Once a clear understanding has been reached between all parties as to what is involved and what results are being aimed for, the methodical process of paint correction is carried out. The above diagram is a simplified indication as to how modern paint systems are laid down. As you can see, scratches can vary greatly in depth and this can affect how they are dealt with. Without proper and detailed paint analasys, as well as a sound understanding of the paint system that is on YOUR car, it's possible for an unskilled operator to do far more harm than good. However, when done professionally, the results can be staggering. What does this all translate to? Perfect paint. It's not hard to see how much gloss, clarity and depth of colour can be robbed by swirls, holograms and marring. Colour can be restored, tired finishes can be reborn and even a factory fresh finish can be refined. Of course, Driven Colour offers much more than just paint correction. We can cater to everything from intensive interior cleaning, rejuvenation and decontamination, to polycarbonate headlight restoration, including reapplication of the OE-style UV coating, signage and vinyl removal, car show and concourse preparation, pre-sale detailing and complete vehicle surface protection. To find out more about what Driven Colour can do for your vehicle, contact us today!